Client injury from sudden or incorrect movement and from falling down. Muscular, soft-tissue or skeletal injury to workers from incorrect movement, posture or lifting the weight of the client. b. Use 1 or 2 workers for this task, as per the Client support plan. c. Check the immediate area is free of obstacles, with enough space to move. Check that client is ready to perform task. Check workers are ready and able to perform this task. Avoid lifting or straining. Workers to stand on either side of client. Workers to stand to side of client with a wide stance. Workers to use their foot to block client's foot, and their knee or thigh to block client's knee. Workers link their forward arm under client's arm, placing the slightly extended back of hand on client's back near the shoulder blade. This posture will facilitate upper body movement for client both forwards and slightly down. 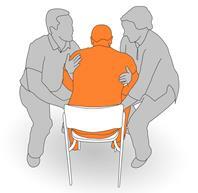 Workers place hand furthest from client on the client's pelvis for forward control of the hips. Lean client forward, and assist them to stand by pushing forwards on their lower back. This movement enables normal movement to stand. Support client and do movement in a smooth, steady action. Do not attempt to lift client or take their weight with either hand. When client is standing, continue to hold them to maintain their balance. 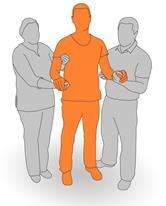 If client is able to walk independently, workers are to remove arm from the side of torso support position. Assist client to walk (if necessary). Does client require some assistance to walk? If so, grasp client by their hand and arm as illustrated. Refer to safe work instruction on Assisting a Person to Walk. Prepare client to sit down. Workers link their forward arm under client's arm, placing the slightly extended back of hand on upper back near the client's shoulder blade. Workers to place hand furthest from client on client's front of hip to push backwards and effect bending at the hip. Workers to lean torso forward while gently pushing backwards on client's hip. At same time guide client back and down into chair. 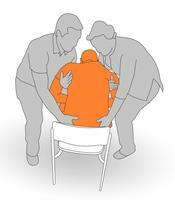 Make sure client is seated as far back into chair as possible. Using knees to block again will assist moving hips back into chair while sitting. Do not attempt to hold client or take their weight. 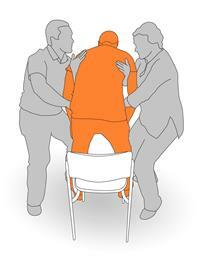 When client safely seated, release torso support hold. Check that client is in a safe posture. Ensure workers have done task correctly.